You have the go-to hangout for Jays fans — the place where local Birds come to have a cold one and talk about their high hopes for Vlad Jr. 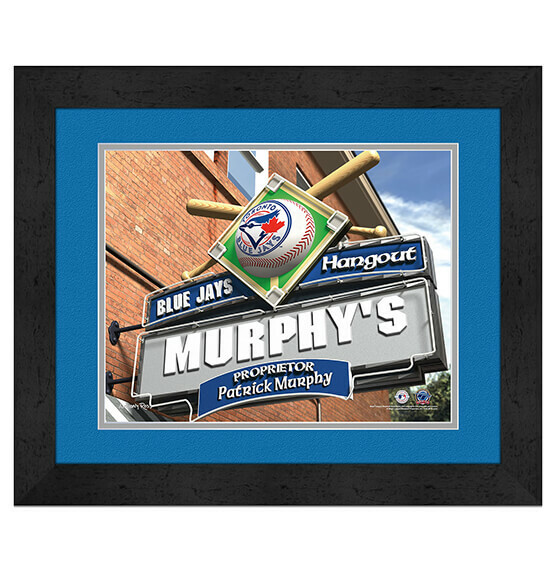 This fantastic Toronto Blue Jays Personalized MLB Pub Sign Framed Print is customizable to depict your specified name or nickname so you can be the envy of all of your fellow Blue Jays fans. This brilliant made-to-order MLB sports decor features Blue Jay team colors and team logos as well as baseball bat, ball and diamond accents on a brownstone's marquee. A quality black frame, glass and premium paper will make this ready-to-hang piece a fantastic addition your Blue Jays fan zone in your home or office.